Californian Ryne, who once claimed the most fun job he’d ever had was when he worked as a plumber, married into a large Irish Catholic family. A practicing Catholic himself, Ryne is not only well known for his novels, he is also recognised in the movie industry. Novels Cloudburst, October’s Ghost, Capitol Punishment, Top Ten, The Donzerly Light, All For One, and Confessions have confirmed his status as being a great author. But when novel Simple Simon was picked up by Hollywood and turned into the 1996 hit movie Mercury Rising, starring Bruce Willis, it opened another door for his writing. In 2008, Ryne worked (uncredited) on scripts for Keanu Reeves movie, The Day Earth Stood Still and Jessica Alba’s The Eye, and in 2009, he was one of four writers who wrote the screenplay Knowing, a concept he himself created. Although first frowned upon by the critics (what do they know? ), Knowing went straight to number one at the box office. American film critic and screenwriter, Roger Ebert boasted it being one of the best sci-fi films he had ever seen. 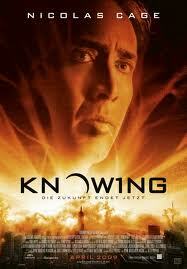 Knowing went on to make more than $180 million worldwide. Ryne is a member of Writers Guild of America-West, Science Fiction & Fantasy Writers Of America and International Thriller Writers. When not writing or spendng time with his wife, children, and two dogs – a Doberman Shepherd and Beagle Vizsla, you can find him twittering with friends. So what would a man, who is described by Entertainment Weekly as having a ‘sweet, disarming quality’ make of our ten questions? 10. If heaven exists, what would you like to hear God say when you arrive at the pearly gates? You’re Late. This is a great series, Donna – lots of fun! Ryne is such a nice guy, too – he’s agreed to be interviewed on skype by my son for his 5th grade “Doomsday” project. Thanks! Oh wow. Kathy, you son must be totally stoked! (That is a term you guys use, isn’t it?) He’ll be the envy of the school. I love your 30 – second interviews! That Ryne sounds like an awesome guy! He’s going to do a skype interview for K.B.’s son? How awesome is that! Crapweasel. I’d never heard of it before speaking to Ryne. I thought it was an American thing. But sci-fi, eh? I’ll have to watch some Battlestar Galactica re-runs (yes, those from the 80’s). I didn’t know Pearson was involved with Knowing. It’s hard to know who has written what in movies (or at least it is for my 2-cylinder brain). I liked it. And your series is expanding my vocabulary no end. Like Pearson and strawberry ice cream, Crapweasel is new to me. I’m off to work, so I might just possibly find the odd chance to drop it into conversation today! Just possibly. Okay, firstly, I love chocolate ice-cream….but lemon-ice. OMG!! Secondly, please let me know the sentence you managed to squeeze ‘crapweasel’ into. Donna, I LOVE this series! Wow, I’m so impressed. Ryan Douglas Pearson? Very cool. And yes I would be stoked if I were Kathy’s son. Ryne is absolutely one of the nicest, most supportive people I’ve met since I committed to my writing. He’s an awesome author, too. I LOVE seeing the two of you together here on your blog, Donna. Thank you to both of you. All three of us are here! Lol.